David Haye has his critics, plenty of them in fact, but two things cannot be denied: Haye’s punching-power and his box-office appeal. This Saturday (on terrestrial channel ‘Dave’ for UK fight fans) the 35-year-old former champ will continue his comeback as he aims for a shot at regaining at least a slice of the heavyweight crown. Haye, 27-2(25) and beaten only by Carl Thompson (down at cruiserweight and seemingly an eternity ago now in 2004) and Wladimir Klitschko, will face unbeaten but largely unknown Arnold Gjergjaj in London and, assuming all goes well, he will then face vocal former WBO heavyweight champ Shannon Briggs in September. Fans may have their views on how both fights will go, but when it comes to pre-fight opinions, there is no-one better to ask than an active fighter who has been in there with one or both of the practitioners we are soon to be watching fight. 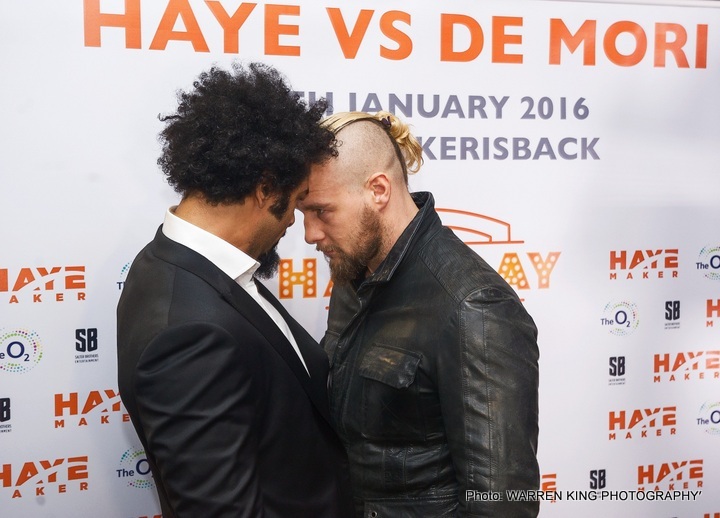 And Australia’s Mark de Mori – 30-2-2(26) and currently back in training for his next fight – faced the comebacking Haye in January of this year; being taken out inside a round by a surprisingly bulked up and apparently faster than ever “Hayemaker.” De Mori was kind enough to share with this writer his opinion on what Haye will do in his next two return fights. If De Mori is right, it could prove problematic for all future Haye foes; not only Gjergjaj, 29-0(21) and Briggs, 59-6-1(52) but also current IBF champ Anthony Joshua. Haye does have, arguably, greater speed of hand than any other active heavyweight and, combined with his undeniable power, he just might be the most dangerous heavyweight in the world for the first few rounds of any fight. De Mori found this out firsthand and he has made no excuses for his loss. But the problem for Haye might be this: what happens if an opponent is able to withstand the early onslaught and take the former cruiserweight ruler into the middle and late rounds? De Mori felt he would be able to extend Haye and then utilise his own strength and power, and so too, no doubt, do Gjergjaj and the ageing Briggs (or maybe Briggs feels he will be able to beat Haye to it and land the swift KO blow himself). The oddsmakers do not agree, however, and neither does the last man to have been in there tasting Haye’s lethal blend of speed and power. Haye has his critics, yes – but not too many of them ever say Haye is dull and not in exciting fights. Look for explosive KO’s both this Saturday and in September, as millions of fans tune in to see the carnage. Haye will indeed prove De Mori to be right.